Igneous rocks, born from molten rock called magma, dominate the western portions of the Eno River. All igneous rocks originate deep in the Earth as magma that rises toward the Earth’s surface at temperatures ranging from 1,800 to 2,200 degrees Fahrenheit (°F) (1,000 to 1,200 degrees Celsius (°C)). Igneous rocks are separated into two main categories: intrusive and volcanic rocks. Intrusive rocks form when magma solidifies within the Earth’s crust. Volcanic rocks form when magma solidifies on top of the Earth’s crust on land or in water. Magma that cools and solidifies before reaching the surface of the Earth forms intrusive igneous rocks. Intrusive rocks are also commonly known as plutonic rocks. The word plutonic comes from Pluto, the Roman god of the underworld. Plutonic rocks form bodies known as plutons. Intrusive rocks cool slowly since they are insulated by the surrounding earth. This slow cooling allows the chemical elements within the magma to organize themselves into individual crystals that are visible with the naked eye. 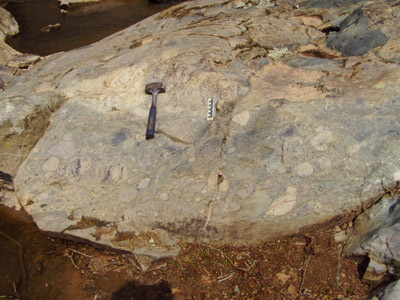 Figure 5 shows an example of a circa 630 million-year-old intrusive rock from the Eno River area. 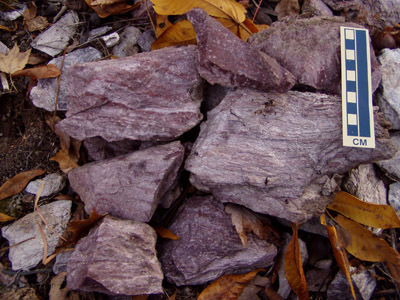 East of Roxboro Road, in the Triassic basin, a relatively young intrusive rock called diabase is present. The diabase is around 200 million years old and is present as tabular-shaped bodies that either intruded the surrounding sedimentary rocks parallel to the existing layering as sills or cut across the existing layering as dikes (fig. 6). 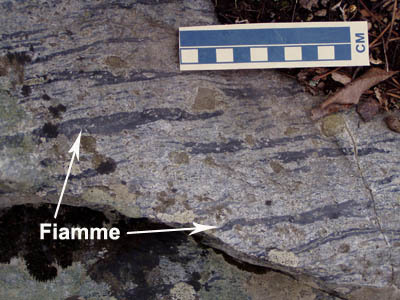 Figure 5 - Example of a 630 million year old igneous intrusive rock of the Carolina terrane. 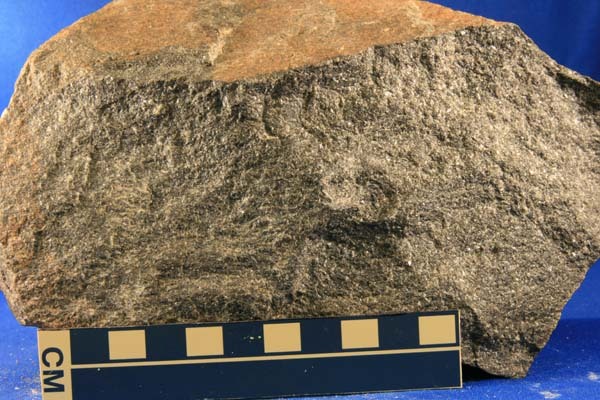 The rock is a granodiorite (granite-like rock) Figure 6 – Sample of diabase from the Eno River area. Photograph shows typical typical rust-colored weathering rind. Volcanic rocks, also born from molten magma, form when hot magma erupts out of a volcanic vent or when magma explodes from volcanoes. The word volcanic comes from Vulcan, the Roman god of fire. Geologists studying ancient volcanic regions, like the Eno River area, use modern volcanoes and their deposits as a guide to help them unravel the geologic history. Modern volcanic terranes are dominated by four basic volcanic deposits: a) lava flows, b) pyroclastic flows, c) tephra, and d) lahars (fig. 7). The Eno River area has evidence of all four types of these deposits. Lava flows, pyroclastic flows and tephra deposits are also known as extrusive volcanic rocks. Extrusive refers to the magma being extruded onto the surface of the Earth. As magma is extruded on the surface, it cools very quickly and individual chemical elements do not have time to grow into minerals visible to the naked eye and produce a fine-grained or aphanitic rock. This is in contrast to the intrusive rocks, that cool slowly, and typically have mineral grains that are visible with the naked eye. When hot magma is erupted onto the surface of the Earth, it is called lava. The word lava is used to describe both moving melted rock, and cooled and hardened rock that originated as lava. Lava flows are streams of molten rock that pour or ooze from an erupting volcanic vent. Lava comes in many types defined by the range of minerals in the rock. Millions of years ago, lava flowed in the Eno River area. One type of rock common in the Eno River area formed from solidified lava is called dacitic lava (fig. 8a). When molten, dacitic lava is viscous (thick and sticky) and does not flow very far from the volcanic vent. It forms steep-sided mounds of lava called domes. Lava domes grow by the extrusion of many individual flows over time. The lava domes within the crater of Mt. St. Helens in Washington State are examples of recent dome formation (fig 8b). Figure 8a – Example of ancient dacitic lava from the Eno River area. 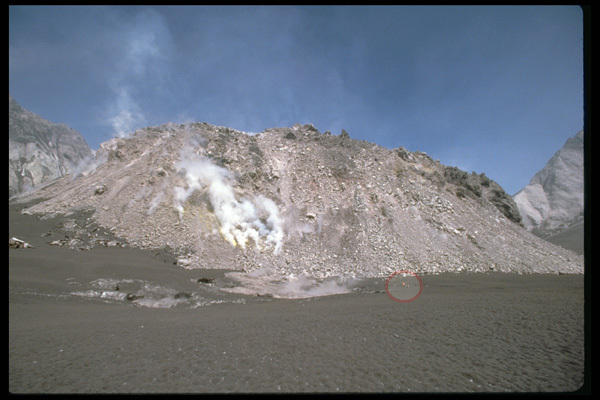 Figure 8b – Modern day example of a dacitic lava dome in the crater of Mt. St. Helens in Washington State. Note people for scale indicated by red circle. Photograph from USGS. Another type of rock in the Eno River area of solidified lava is basaltic lava (fig. 8c). Basaltic lava, or basalt, is typical of the Hawaiian Islands (fig. 8d). Basaltic lava differs from dacitic lava (dacite) in that it is less viscous (able to flow easier and faster) and tends to spread out from the vent forming thin sheets of lava. This results in thinner geologic deposits when compared to the larger dome-like deposits of dacitic lava. Figure 8c –Example of basaltic lava exposed in the Eno River area. 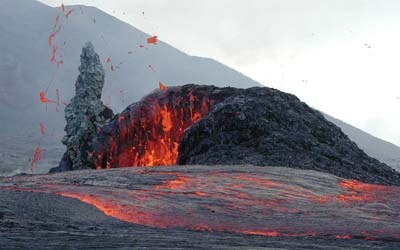 Figure 8d –Example of basaltic lava erupting from a vent on Kilauea Volcano in Hawaii. Photograph from USGS taken by C. Heliker, September 12, 2003. Pyroclastic flows are formed from explosive volcanic eruptions and are fast-moving clouds of hot gas, rock fragments and ash. The rock fragments can range in size from ash to boulders and can travel across the ground hurricane-force speeds often more than 60 miles per hour (100 km per hour). 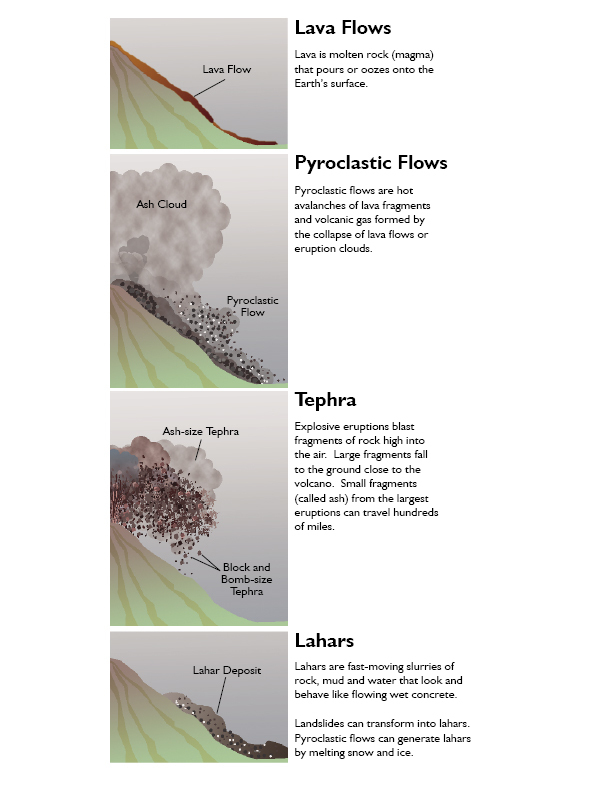 Pyroclastic flows are violent and will knock down, shatter, bury or carry away nearly all objects in their path. These flows are also very hot, generally between 400°F and 1,300°F (200°C and 700°C) and will virtually incinerate anything in their path. 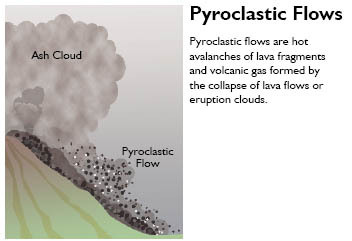 Pyroclastic flows typically form during the collapse of lava domes or after the collapse of dense eruption clouds. Rocks interpreted to have been deposited via pyroclastic flows are common in the Eno River area interlayered with dacitic lavas (fig. 9). Figure 9a – Example of ancient pyroclastic flow deposits from the Eno River area. Outcrop of welded lithic tuff with flattened pumice (fiamme) from the Eno River area. Figure 9b – Example of ancient pyroclastic flow deposits from the Eno River area. Reddish-colored welded tuff from the Eno River area. 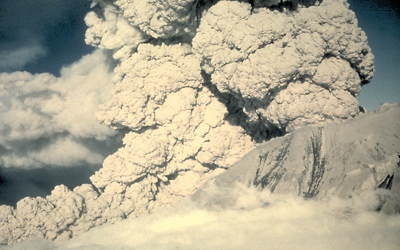 Figure 9c – Example of a modern day pyroclastic flow eruption at Mount St. Helens on July 22, 1980 (USGS). 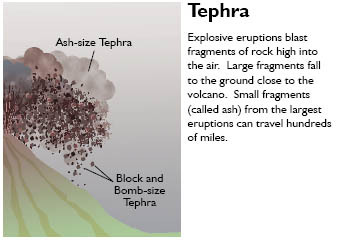 Tephra is the general name for fragments of volcanic rock that are blasted into the air by volcanic explosions or carried upward by hot gases in eruption clouds above volcanic vents. Tephra can range in size from less than 1/32 inch (2 millimeters) to more than 3 feet (1 meter) in diameter. Tephra less than 2 millimeters diameter is called volcanic ash. Tephra consists of a wide range of rock particles, including combinations of pumice, glass shards, crystals from different types of minerals, and shattered rocks of all types (igneous, sedimentary and metamorphic). 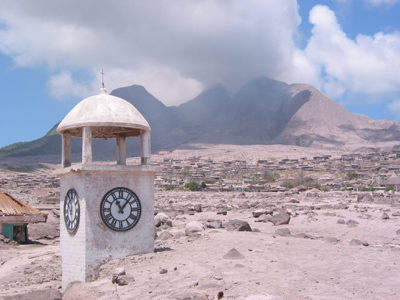 The largest-sized tephra (rocks several meters in diameter) typically is deposited close to the erupting volcanic vent. The fine-grained ash may be blown by the wind hundreds to thousands of miles away. A single eruption can rain down tephra and blanket the landscape close to the volcanic vent with hundreds of feet of ash and volcanic debris. Farther from the volcanic vent, the tephra that falls to the ground is smaller in size and forms only a thin layer of ash a few centimeters thick. When the tephra is buried and hardens into rock it become a rock named tuff. The tuffs exposed today in the vicinity of the Eno River (fig. 10) record hundreds, possibly thousands, of ancient eruptions. Figure 10a – Example of tuff with white-colored weathering rind from the Eno River area. Scale bar is in centimeters. 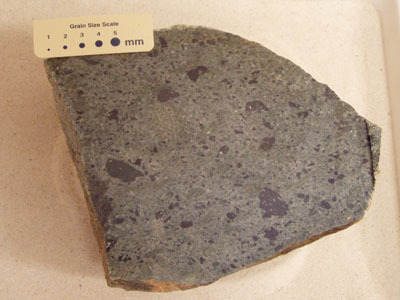 Figure 10b – Example of lithic tuff with black clasts of dacitic lava in a green ash matrix from the Eno River area. 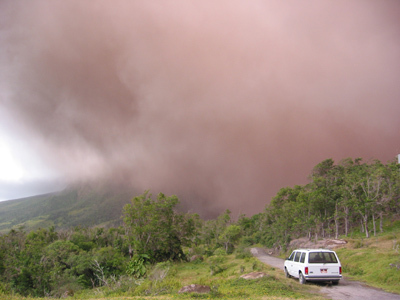 Figure 10c – Example of an ash cloud from an eruption of Soufriere Hills volcano on the Caribbean island of Mountserrat. Photograph by Heather Hanna 2002. 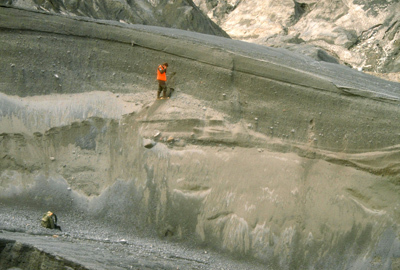 Figure 10d – Example of layered ash deposits from 1990 eruption of Redout volcano in Alaska. Photograph from USGS. Lahar is an Indonesian word used by geologists to describe a mudflow associated with volcanic activity. 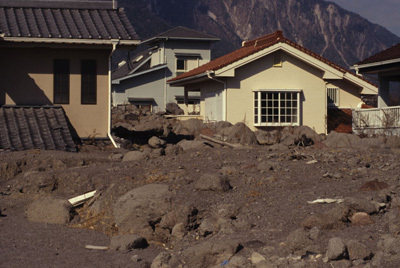 Lahars are very powerful and are capable of moving great quantities of debris (as large as house-sized boulders) long distances in a short amount of time. Modern lahars look and behave like flowing wet concrete and destroy virtually everything in their path – including houses, cars, trees, etc. (fig. 11a and 11b). Volcanic eruptions may initiate lahars when snow or glacial ice is rapidly melted and travels down the mountain. Lahars may also be initiated during steam explosions or the collapse of a volcano from earthquakes. Intense rainfall, years after a volcanic eruption, may destabilize volcanic debris and initiate a lahar. Lahars typically follow the topography and flow into, and fill in, valleys on the flanks and base of a volcano. Lahars are one of the most dangerous features of modern volcanoes. An example of an ancient lahar deposit is visible at Few’s Ford in Eno River State Park (Allen and Wilson, 1968 and Rochester, 1978) (fig. 11c). The lahar deposits at Few’s Ford are described as part of the field trip guides of this publication. 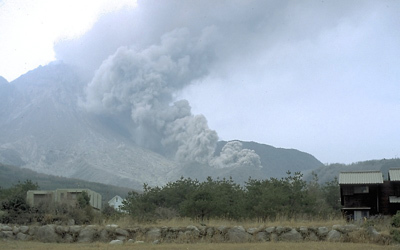 Figure 11a - Lahar deposit from 1995 on southwest flank of Unzen volcano, Japan. Photograph by Tom Pierson - USGS. 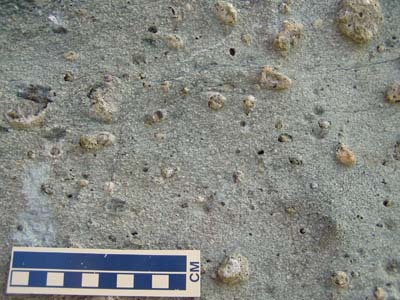 Figure 11b - Lahar deposit from eruption of Soufriere Hills volcano - Town of Plymouth, Mountserrat. Photograph shows war memorial buried in approximately 18 feet of ash and lahar deposits. Photograph by Heather Hanna 2002. 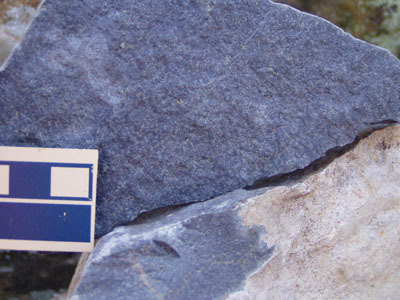 The majority of the igneous rocks associated with the Carolina terrane have been subjected to low-grade metamorphism; subsequently, the prefix “meta” is commonly added to the rock name. The metamorphosed igneous rocks should technically be called meta-intrusive rocks (e.g., metagranodiorite, metagranite) and metavolcanic rocks (e.g., metatuff and metabasalt). Since many of the rocks exposed along the Eno River retain the original intrusive and volcanic textures present in the rock at formation, geologists often leave off the “meta” prefix. The low-grade metamorphosed examples of the above igneous rocks from the Eno River area are still excellent examples of igneous rocks for in hand sample they show all the same textures as a pristine un-metamorphosed rock. Allen, E.P., and Wilson, W.F., 1968, Geology and mineral resources of Orange County, North Carolina: Division of Mineral Resources, North Carolina Department of Conservation and Development, Bulletin 81, 58 p.
Rochester, L.L., 1978, A geologic investigation of the Cates ford [Fews ford] area, Orange County, North Carolina, unpublished Senior Thesis, University of North Carolina, Chapel Hill, 11 p.